Klicea is a keen artist who has cerebral palsy. She has limited use of her arms so uses her mouth to draw. However, she finds it difficult to do so on her flat school table and needed some help. 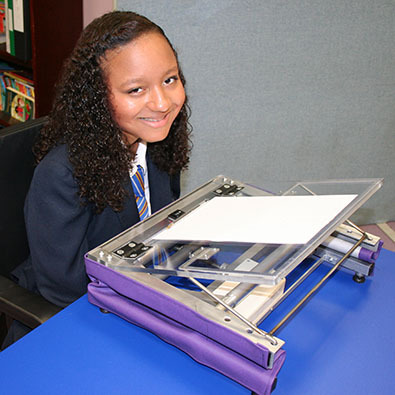 Klicea’s Occupational Therapist contacted DEMAND with the problem and as a result our team designed a height and angle adjustable table, complete with back light, which allows Klicea to draw more comfortably and enjoy her art anywhere around the school.